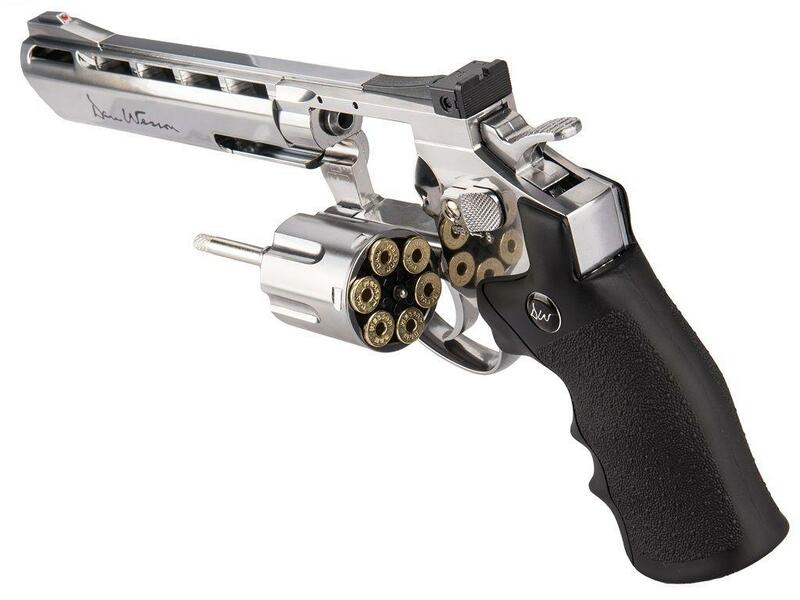 Dan Wesson 6 Inch CO2 BB Revolver | ReplicaAirguns.ca | Easter Weekend Sale! 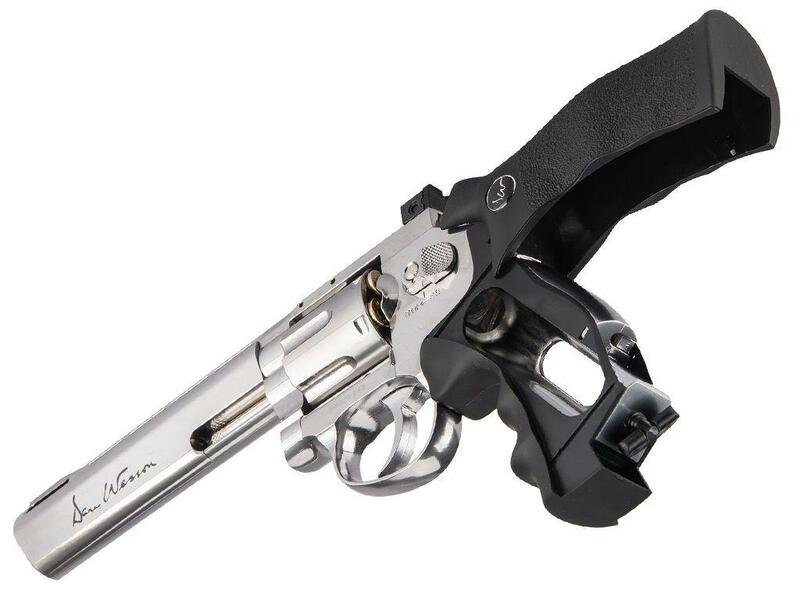 Trigger Pull: The ASG Dan Wesson Revolvers has a predictable trigger with the single action being a bit more consistent, not just in feel but in FPS also. Double action mode is very usable without a lot of extra pressure required. I found I just wanted to shoot this gun in single action mode because it felt more natural with a six shooter. Accuracy: I shot this Dan Wesson Revolver at a target from 20 feet away in a free standing position and it performed well, getting a 1.5 to 2 inch grouping just to the left of the target. The sights are adjustable for elevation and windage, so getting this guns centered on the bullseye would be very easy. My Chrony testing with a six shot averaged result was 395 FPS. Build Quality: This fine revolver is extremely well built, I am beginning to think just about any product from ASG would not disappoint me, after reviewing the Dan Wesson revolvers and CZ 75 P-07 DUTY pistols. The Dan Wesson BB revolver is almost all metal with just a few components made out of plastic, like the handles and CO2 screw tab. The handles feel like a cross between plastic and rubber. 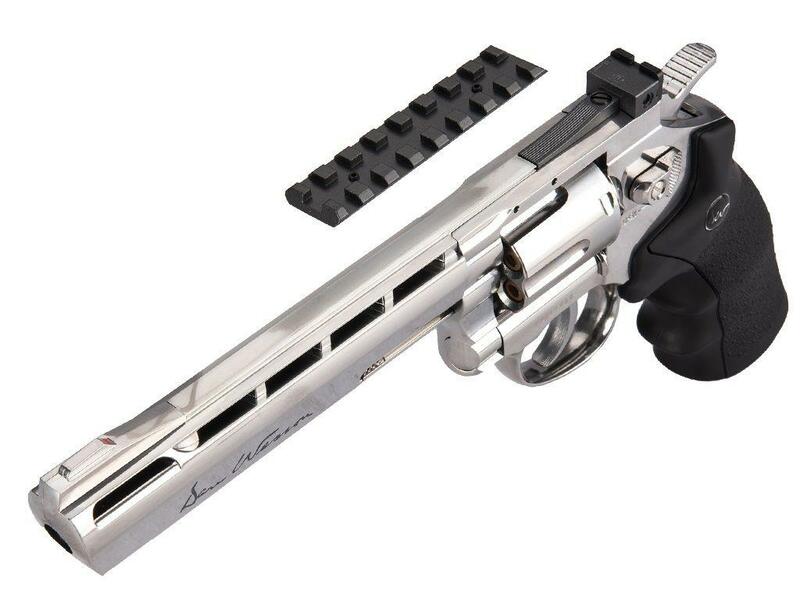 The finish on the six inch silver Dan Wesson is amazing and looks just like polished stainless steel. Realism: The ASG Dan Wesson BB revolver is as close as you can get to a real six shooter, ASG didn't leave any detail out and thought of a few features I may have never even dreamt up! Loading and ejecting actual brass shells into the cylinder makes you feel like this gun is much more then an unassuming airgun! Comments: I'm not really a revolver person, or should I say I wasn't really a revolver person, until I got my Dan Wesson! I felt this way because most of the air gun revolvers available look just like that - they look like air guns! 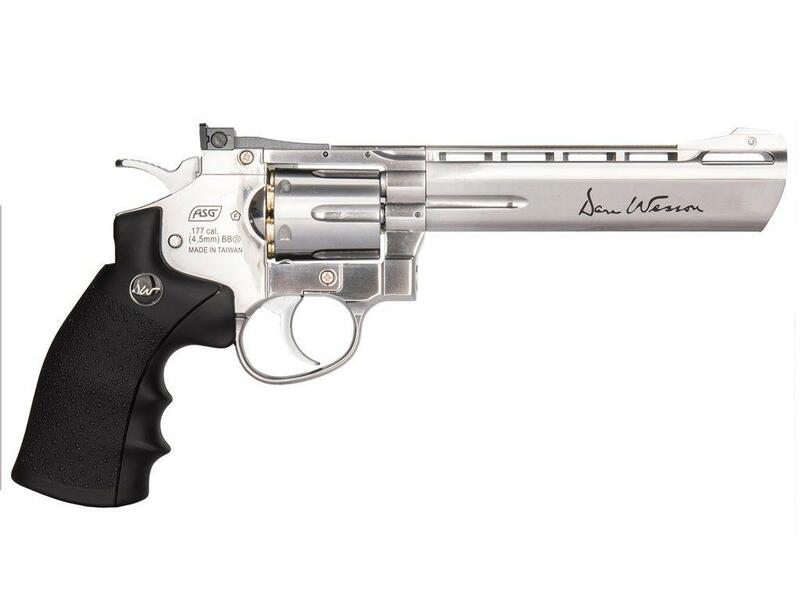 The Dan Wesson BB revolvers showed me that an air gun revolver can be just as cool as any of my very realistic automatic air pistols in my collection. 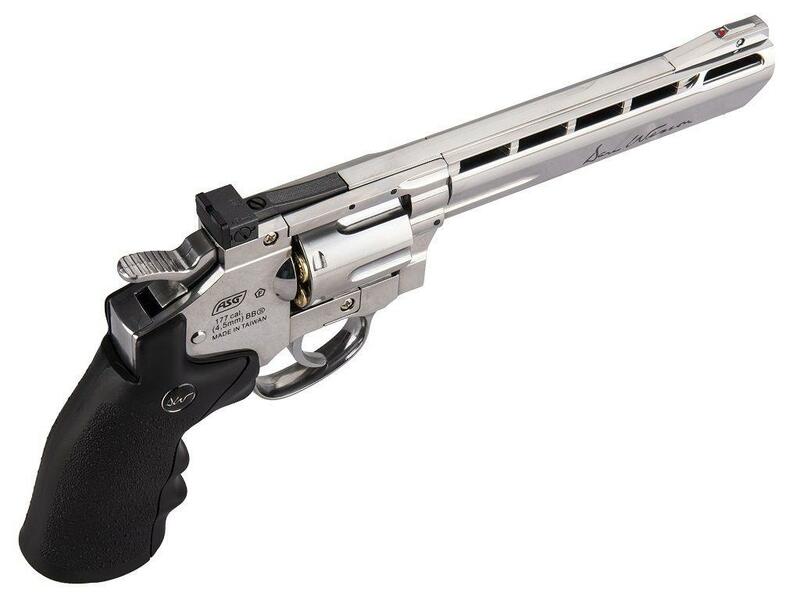 And if you where already a revolver fan then the Dan Wesson CO2 BB revolver is definitely for you. I have owned this gun for several years and it still works like new. A really fun, accurate, and realistic gun. This gun is meant for bb's but I tried rounded pellet in it and it works. 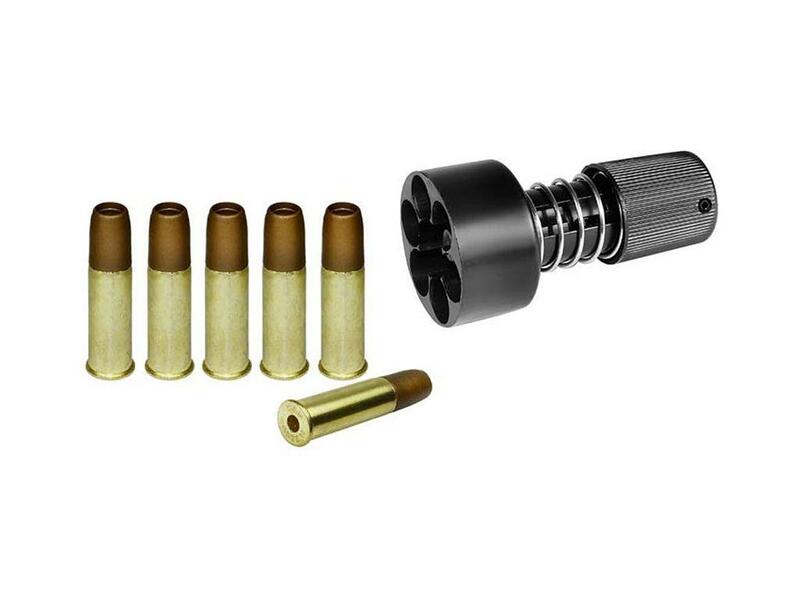 Takes a little more time to load but you can get away with it if the pellets are rounded and not too long. Just push them into the "bullets". The barrel isn't rifled but it still shoots them just fine. All in all it's a great gun. Great gun! Looks awsome, quality finish, very accurate and powerful right out of the box. Strongly recommended! Whilst I realise this gun is meant to be more of a replica of a .357, one can't help but notice it's very similar in design to a modern .44. At any rate it is just fuggin' awesome. Terrific build quality. What stands out the most is its heft; it's almost a full weight gun. It feels good in my hand .. Sometimes a little too good ... It's very easy to enjoy this thing just holding the gun with a big ol' grin on my face.I bought this to use as a movie prop for a local movie company I work for. 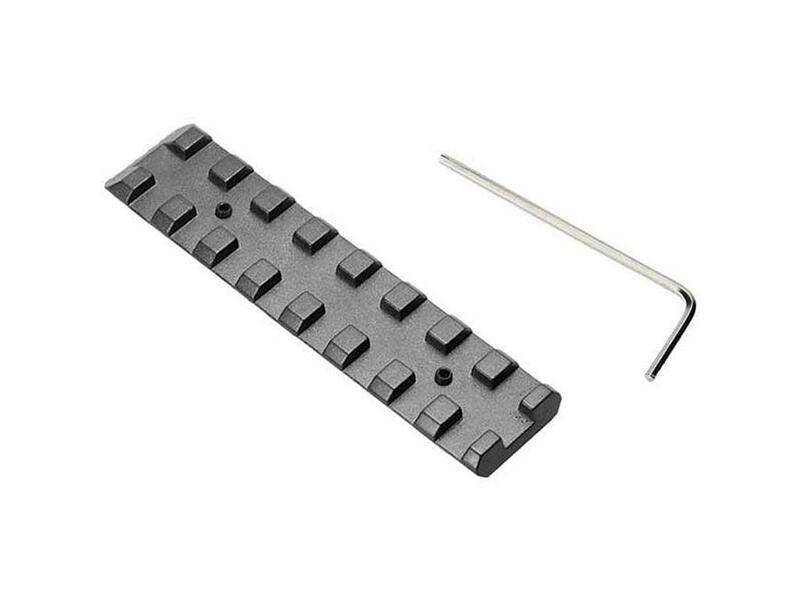 We make extremely low budget movies but I figured it'd be cool to have something like this for our movies should we ever have a seen that requires a gun. My producer (who has family members that are cops, so he's seen a few guns in his time) was very impressed with the faux bullets that can be loaded and unloaded just like the real article.I can't really vouch for its accuracy alive not really had a chance to use it yet but I've fired it off a few times and hit my targets where I wanted so it looks pretty good to me. I guess the only question you should have is, do you buy the steel version, or the black version? I would definitely go with BB rather than pellet as the BB version is more powerful (according to what I've read on the spec sheets).Awesome gun and a perfect movie prop. I bought this gun for leisure and target practice. I've owned many airsoft/pellet guns in the past, and this being my first CO2 powered one. I've gotta say, it's a real nice gun. It feels like a real .357in your hand, very accurate shots, and very powerful. Very sturdy, mostly steel (or whatever metal used) construction. However only 6 cartridges included in the box.